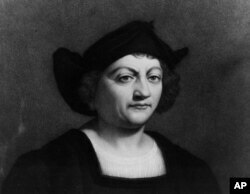 In the United States, October 12 is significant as the date explorer Christopher Columbus discovered the Americas.The achievement, which is commemorated on the second Monday of October, is a source of pride, particularly within the Italian-American community because Columbus was Italian. But for some the holiday is marked by controversy. John Viola, president of the National Italian-American Foundation, said the significance of the holiday is varied. “It's an opportunity and holiday that we are able to celebrate what we've contributed to this country, to celebrate our history of our ancestors," he said. "I think for the rest of the country, Columbus Day is a vehicle to celebrate this nation of immigrants." Italian-Spanish explorer Christopher Columbus is shown in this work by Italian painter Sebastiano Del Piombo. To some, Columbus was a great explorer. But others are offended by his legacy. Joe Genetin-Pilawa, history professor at George Mason University, said the explorer enslaved many of the natives he encountered. Hundreds of thousands more died of diseases introduced by the European visitors. “Within 10 years in the initial of landfall in 1492, so by 1502, we estimated that the Taino, the native people who lived in the Bahamas, the population dropped from approximately a million to 500," he said. Robert Holden, deputy director of the National Congress of American Indians, said the history of Columbus is distorted. "It's always been questionable in terms of native people's tribal communities and how we look to what was written by non-native people for a non-native audience,” he said. David Silverman, history professor at George Washington University, said the whole story should be told. "I don't think you need to focus on one aspect of his past and to neglect the other. You bring them both together and so that he becomes a three dimensional figure," he said. FILE - Demonstrators stand during a Native American protest against Columbus Day. Some in the United States choose to celebrate Indigenous People's Day in place of Columbus Day. Genetin-Pilawa said the name of the holiday should be formally changed. "I definitely think that we should question maintaining a federal holiday for Christopher Columbus. As to what day that could become, I support the creation of Indigenous People's Day," he said. But Viola disagreed, saying Native Americans should find another day to celebrate their cultures. “I think it's a good opportunity for the indigenous community to find a day that they can rally around issues they can grab onto and an opportunity to say, 'ok, hold on. Let’s talk about what this means to us,'" he said.